Multiple quotes, qualified installers, buy or lease with no-money-down. Have you installed a system at your home or business? Share your experience by creating a case study to encourage others to take action. Is my roof even suitable for solar? We built a cob masonry mass heater with rocket stove burner technology as part of a three day hands-on workshop by the Local Living Venture on September 21-23, 2012. It has a hand-made earthen cob exterior with a firebrick and stove pipe interior. Has a chaise lounge built in as well as a bench for guests and a warming spot for the cats. Heats the house with a continuous radiant heat for 2-3 days after firing -- using a fraction of the wood that was cut, split, stacked, hauled and loaded previously, and you KNOW that's good! A warm bench for my tushie on cold winter nights. About monthly ash clean out -- of very small amounts of very fine, thoroughly combusted wood ash. Regular chimney inspection, shouldn't be much to clean though due to near zero creosote. Requires a well-insulated home to be of any use, in my opinion. Our non-profit organization coordinates rural skills workshops and this was one of our projects. My home had a concrete pad and chimney outlet ready to go for a masonry stove, all it was waiting for was an excuse to do it! When the idea of doing the masonry heater with rocket stove technology came up, it was a done deal. Rocket stoves require intensive handling WHEN THEY ARE GOING but then save you hours of loading and so on over the next day or two, so perhaps it evens out. Still, you need to pay attention while it's going for the 2-3 hours of combustion time. The workshop to build this stove took 2-1/2 days because it was a hands-on experience for 25+ people that also included "classroom" sessions on fire science and lots of Q&A time as well, but this unit could be built by two motivated people in two days if all of the materials were lined up first. Saturday, October 5, from NOON to 3 pm ONLY. This is the home of the regional tour organizer for the Local Living Venture, FYI. Note that we don't have any responsibility for the EnergySage website you're viewing, that's the NESEA.org folks who are coordinating the overall event! :-) DIRECTIONS: From Canton take Park St. until it turns in to Rt. 27 (no turns, go straight at the flashing light.) Take Rt. 27 to the Y at Waterman Hill - take the Right fork (still Rt. 27) and check the odometer -- exactly 4 miles from the Y, you'll take a Right onto Hewlett Rd. (if you come to a stop sign at Rt. 24/Russell Turnpike you've gone 1 mile too far.) The third tiny dirt driveway on your right is just past the double mailboxes, across from a red log cabin. Please park in the driveway on the road and walk the short distance (several hundred feet) down to the house, back in the woods. 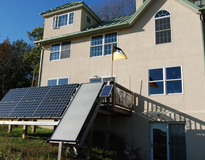 Passive and active solar home with very primitive systems, we live comfortably (though not without conserving!) on next to nothing. Composting outhouse, walking water instead of running water, root cellar refrigeration, Swedish gutter rainwater collection, cooking with wood, indoors or out, and wood heat via mass masonry heater with rocket stove burner. Get the best deal on solar. 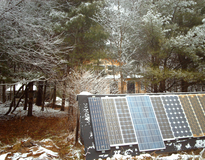 By sharing your first-hand experience about your clean energy system, you have helped others in their decision. You can add as many case studies and edit them any time you want. Would you like to add photos? There's nothing like seeing images of a real installed system. There is no limit to the amount of photos you can add!